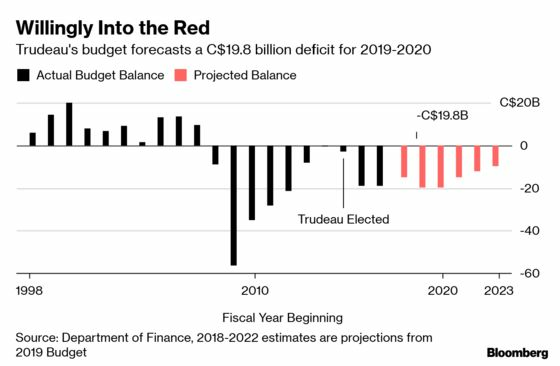 (Bloomberg) -- Prime Minister Justin Trudeau’s government released its 2019-20 budget Tuesday in Ottawa, using a windfall in new revenue to increase spending while leaving Canada’s fiscal track largely in line with what it projected in November’s fiscal update. Here are the highlights. The government introduced C$22.8 billion ($17 billion) in new policy actions through 2023 -- mostly spending - including C$4 billion in funding for the coming fiscal year plus an immediate lump-sum payment of C$3.2 billion for municipal infrastructure and energy efficiency programs that will be accounted for in the 2018 budget. It provides some additional stimulus, worth just over C$7 billion over the next year or so. That’s not enough to move the needle much on economic growth in 2019 -- at most two-tenths of a percentage point this year -- and won’t alter the Bank of Canada’s interest-rate outlook, economists said. Canada will increase bond issuance in 2019-20 to C$119 billion, from C$100 billion in the current fiscal year, in part due to more maturities. The ratio of debt to gross domestic product will drop to 28.6 percent by 2023 from 30.8 percent in 2018-19 - - little changed from November. That ratio is projected at 30.7 percent for the 2019-20 fiscal year, giving the government no more room for additional measures if it is to keep to its pledge of reducing debt-to-GDP every year. Housing: The government introduced new measures to help first-time home buyers, including a shared equity mortgage program run by Canada’s federal housing agency. They will also allow first- time buyers more access to retirement savings plans to purchase a home. Canada Mortgage & Housing Corporation will provide funding up to C$1.25 billion over the next three years for the program, which will have very little fiscal cost for the government. The budget also allocates more funding for housing supply, worth more than half a billion dollars over five years. Skills: Additional spending is being allocated for training, both through a new training credit program and through the Employment Insurance system. The cost of the training credit is seen at about C$700 million over five years. Student Loans: Lower interest rates on Canada Student Loans is one of the more expensive new items, costing C$1.7 billion over five years. Pharmacare: The government introduced what it believes are the first steps toward a national pharmacare program, including the creation of a new Canadian Drug Agency to coordinate purchases of prescription drugs and make high-cost drugs for rare diseases more affordable. Negotiating better prices could help lower the cost of prescription drugs by C$3 billion a year in the long term, it said. Seniors: Another high cost item, worth C$1.8 billion over five years, is to enhance guaranteed income payments to old-age pensioners. Electric Cars: New incentives to buy electric cars, including purchase incentives of up to C$5,000 on new vehicles, will cost more than half a billion over five years.